How are the new poles supposed to be held together? Are the drilled holes supposed to line up? What hardware should I use to put it together? Are the screws that hols the loop supposed to be stripped? Btw I am refering to the new 2 piece pole assembly that is bieng issued now. you can rivet (but this makes it permanent and less easy to break down) or use a self tapping screw, they leave it up to the user. Make a 12 foot long, shoe box style sailbox. Then you have no worries about transporting/storing your full size spin pole. I used 4X8X1/4 inch sheets of plywood and glued up with an 4 foot offset. The results were sheets 4X12X1/2 inch. Then I cut to size for the sides, top and bottom then glassed/painted for weatherproofing. Since I have a double stack trailer, I made the box big enough for two Tigers worth of stuff. See the end result in the background of the attached photo. 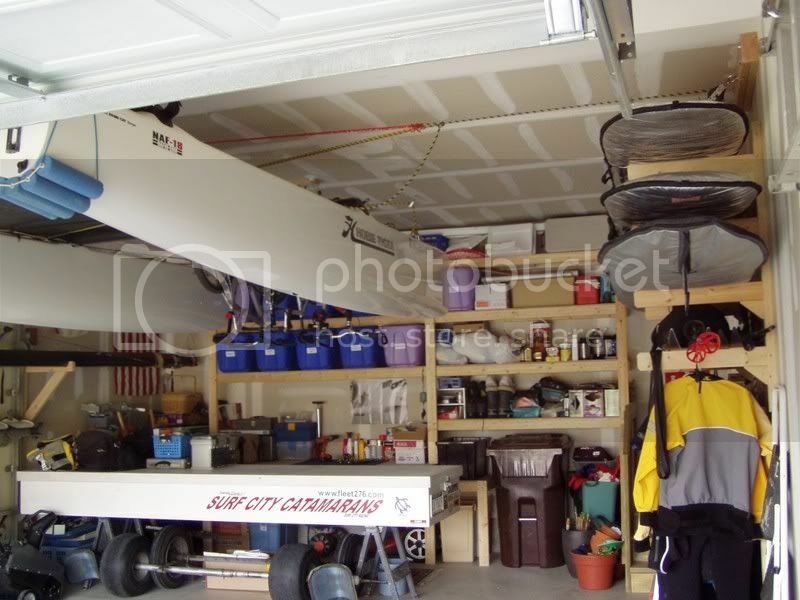 Are those sailboards in your garage? Sorry Tom...those are surfboards. I surf the Great Lakes when I'm not sailing. 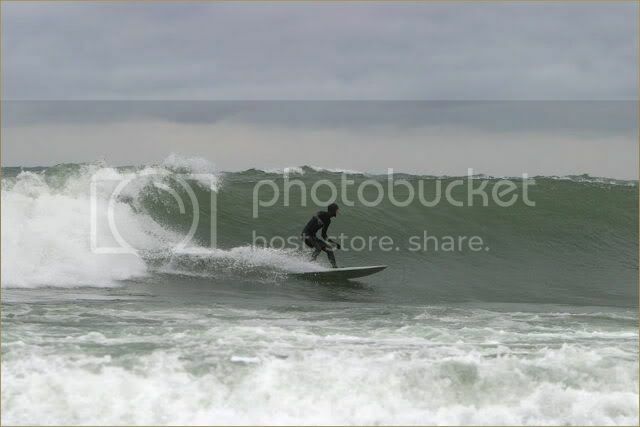 The photographic evidence of Great Lakes waves is shown below...somewhere (secret spot) on Lake Michigan in November. Nice Surf City plug and nice wave JB! Somethin' aint' right about that boy . . .
That's not cool. This is why we should be able to make our own, and remain class legal. Yep and if they forget to ship your spin pole with your brand new FX One, then they send you a two piece so it is easier for them to ship. I'm still a bit pissed about that. I am not sure if i got a replacement pole or they just took the one that was supposed to come with my boat and cut it in half. In any case, you should get what you are purchasing, in my opinion. I have learned to be very specific when ordering parts from Hobie. I always inspect every thing thoroughly. You can buy a new 1 piece spin pole its $16,500.00 for the Tiger and $22,500.00 for the Wildcat pole. You just get extra parts for that price. I understand shipping being a pain in the pooper for a 12' piece of aluminum, but everyone else seems to have a handle on it. I just see it as a compromise that isn't worth it. Not a garentee, read my post, I ended up with a two peice with my new boat. This thread is taking a turn to negative-ville. Again, if you are not satisfied with something speak to your dealer so we can remedee it! What's wrong with a 2 piece spinnaker pole anyway? Anybody been windsurfing in the last 15+ years? I was wondering the same thing. All windsurfing masts currently made are 2-piece masts. This is true for all manufacturers, all constructions, and all sizes (from 340cm to 580cm). As long as the mast is made and used properly, there are no issues. Much easier to ship and store a two-piece. Also, if it breaks, sometimes you can just replace the broken half rather than the whole thing.